Posted on April 30, 2018 Categories realDonaldTrumpLeave a comment on The Fake News is going crazy making up false stories and using only unnamed sources (who don’t exist). They are totally unhinged, and the great success of this Administration is making them do and say things that even they can’t believe they are saying. Truly bad people! Posted on April 30, 2018 Categories realDonaldTrumpLeave a comment on During Small Business Week, we celebrate the great, hard-working entrepreneurs across our country who have started and operate a small business! Posted on April 30, 2018 Categories realDonaldTrumpLeave a comment on The migrant ‘caravan’ that is openly defying our border shows how weak & ineffective U.S. immigration laws are. Yet Democrats like Jon Tester continue to support the open borders agenda – Tester even voted to protect Sanctuary Cities. We need lawmakers who will put America First. Posted on April 30, 2018 Categories realDonaldTrumpLeave a comment on Numerous countries are being considered for the MEETING, but would Peace House/Freedom House, on the Border of North & South Korea, be a more Representative, Important and Lasting site than a third party country? Just asking! Posted on April 30, 2018 Categories realDonaldTrumpLeave a comment on The White House Correspondents’ Dinner is DEAD as we know it. This was a total disaster and an embarrassment to our great Country and all that it stands for. FAKE NEWS is alive and well and beautifully represented on Saturday night! Posted on April 29, 2018 Categories realDonaldTrumpLeave a comment on Headline: “Kim Prepared to Cede Nuclear Weapons if U.S. Pledges Not to Invade” – from the Failing New York Times. Also, will shut down Nuclear Test Site in May. Posted on April 29, 2018 Categories realDonaldTrumpLeave a comment on The White House Correspondents’ Dinner was a failure last year, but this year was an embarrassment to everyone associated with it. The filthy “comedian” totally bombed (couldn’t even deliver her lines-much like the Seth Meyers weak performance). Put Dinner to rest, or start over! 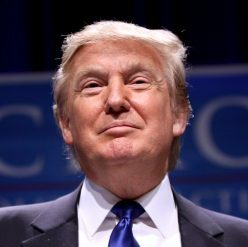 Posted on April 29, 2018 Categories realDonaldTrumpLeave a comment on “Trump’s Triumphs are driving his critics Crazy!” Thank you Steve Hilton @NextRevFNC, just want to do what is right for our wonderful U.S.A.